With the launch of the Women's League, the PFF is hoping for continuity in improving the feminine side of the beautiful game. PASIG -- Everyone inside the boardroom of the House of Football yesterday afternoon expressed hope for the upcoming Women's League which will kick off next week. Apart from officials of the PFF, the coaches and players of the participating teams gave opening statements in front of the press about the upcoming tournament, the third the governing body of football had organized in as many years. "I'm expecting a very good competition," said Women's Committee chair Lalaine Sarmiento to open the forum with the football media, noting that the players mostly came from the UAAP that also became the nucleus of the current national pool. UP's Cristina Delos Reyes echoed Sarmiento's statements, with the forward had played for the country in the senior level. "I hope so," she replied when she was asked if they can endure the double round robin format in the 11-team field. FEU tactician Let Dimzon echoed Sarmiento's thoughts but she still expects that the teams from the UAAP are still the favored for the title. "Mataas expectations sa amin, since karamihan sa clubs ay mga alumni ng mga teams, saka maganda magiging exposure sa mga tulad ng Kaya, who will play for themselves pero yung mga UAAP teams ang expected na magcocompete for the title," Dimzon said. But for La Salle's Hans-Peter Smit, never count the other squads out of the equation, noting that the alumni squads like Outkast, Fuego Espanya and Green Archers United had players who previously played in the UAAP before. "Everybody knows how we play. We'll never know, it's a league. It's interesting for the girls that they do not need to play for the semi-final," the fiery coach stated about the format being used, and added that the only thing that matter on this league will be on brains against the youth. "We're just gonna play it smart, because there are a lot of younger teams that will run faster and last longer than us," added Clara Poblador of Green Archers United, added that the league gives them more exposure to the full game, apart from their team being a staple in pocket tournaments. UST's Aging Rubio said that the league attracted the young promising booters to give them much needed exposure and she hopes that it will continue. "Siguro despite the fact na konti matches ng women's football, kung napapansin niyo, kahit sa UAAP mataas ang level of intensity," she said, noting that with the Women's League, UAAP Teams will now play for a total of 30 games next year. Having the youngest team gives them slight advantage over their opposition, yet Kaya's Steve Nicholls noted that they have to adjust from the UFL Youth to a more mature game wherein they will play against teams whose squad are more than six years older than them. "There will be a disparity between our girls and them," he said, added that the core of their squad will come from their academy wherein their average age of their players is at 16 to 17 years old. Apart from empowering the players, the PFF is hoping that the other aspect of women's football will follow suit, especially in the officiating and coaching side. "It's not just the players that will benefit from this program. The players, the coaches, the technical officials, even the PFF. Because everybody will be benefiting from this one. We also see potential profession in the future, like former players venturing to coaching or refereeing. It's a development for all," Sarmiento added. 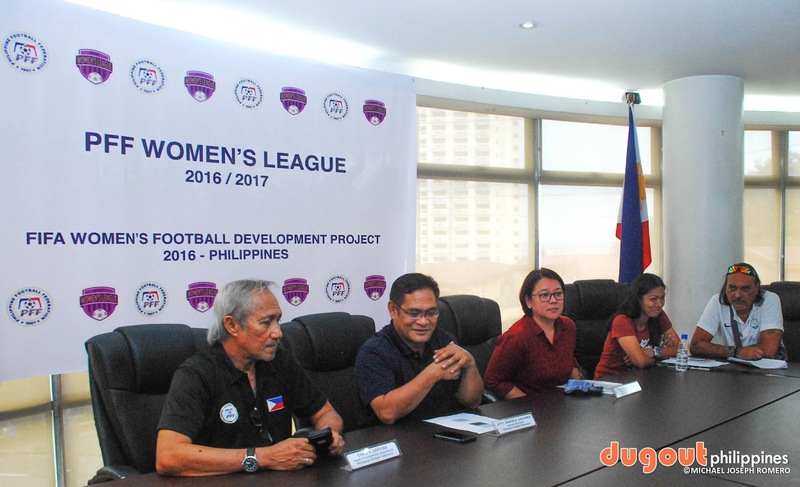 The PFF Women's League will kick-off on November 12 at the Rizal Memorial Stadium and will run until July of next year.